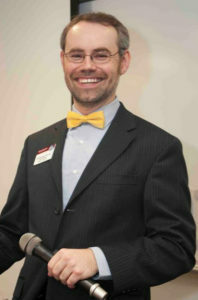 Nick joined Plantation Toastmasters in 2006 and has embraced the leadership aspects of this organization. During his time with Plantation Toastmasters, he has served as Club President, Club Vice President of Education twice, Club Vice President of Public Relations (currently serving his second time), Club Vice President of Membership and Club Secretary. During a few years while living out of the area before he moved back here, he served as Club President for Bonita Toastmasters near Naples, FL in 2014 and as Club Treasurer for Chautauqua Talks Toastmasters in upstate NY in 2010. He recently finished his run as Area Director for Division B, Area 23 here in South Florida, District 47, earning the award of Select Distinguished Area (as all of the clubs in this area earned Distinguished Club status or better). Nick currently works in Information Technology as IT Director of a Digital Marketing firm.